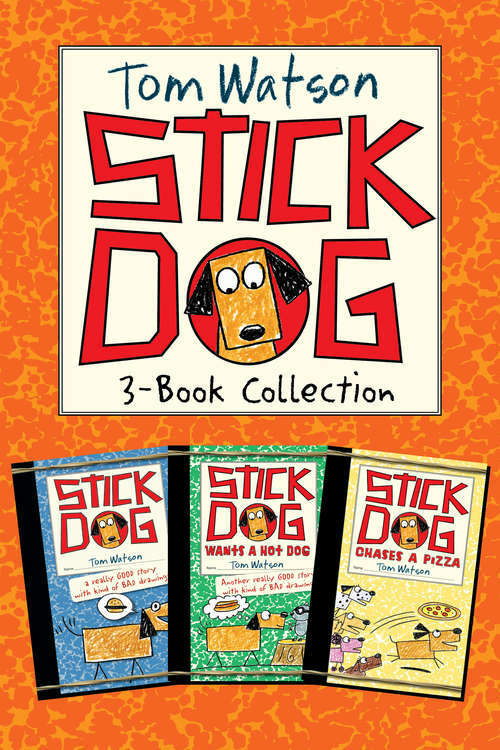 This collection includes the first three books in the bestselling Stick Dog series: Stick Dog, Stick Dog Wants a Hot Dog, and Stick Dog Chases a Pizza. These heavily illustrated, fun books are perfect for fans of series such as Diary of a Wimpy Kid and Big Nate.Stick Dog: Introducing everyone's new best friend: Stick Dog! He'll make you laugh . . . he'll make you cry . . . but above all, he'll make you hungry. Follow Stick Dog as he goes on an epic quest for the perfect burger. With hilarious stick-figure drawings, this book has a unique perspective, as the author speaks directly to the reader throughout the story in an engaging and lively way.Stick Dog Wants a Hot Dog: In this second book, Stick Dog and his four friends, Poo-Poo, Mutt, Stripes, and Karen, must execute a master plan for stealing hot dogs. The closer they get to the hot dog vendor, the more difficult their mission becomes. With the same hilarious antics, the five dogs are met with many challenges along the way, including having to distract the frankfurter guy and Karen getting locked in a human's house. No matter what, these dogs have their eyes--and stomachs--on the prize.Stick Dog Chases a Pizza: Stick Dog returns with the same crazy crew. This time these canine friends have discovered a newfangled flavor--and it's even more delicious than hamburgers and hot dogs. It's pizza! And they won't be satisfied until they get some slices of their own. But it won't be that easy. There's a kitten to rescue, a plan to make, and the messiest--and most dangerous--game of catch they've ever played. Pizza is on the menu, but only if their mission succeeds.